Rosie Thomas calls on friends like Sufjan Stevens to help craft her best record yet. Rosie Thomas has always kept good company. The Seattle-based singer/songwriter got her start as a solo artist, remember, thanks to a guest spot on her friend Damien Jurado's Ghost of David record. She's contributed to projects by Jeremy Enigk and Denison Witmer, there's been talk of her working with Sam Beam, and last spring Pitchforkmedia.com reported about the lovechild she had with banjo-slinging sensation Sufjan Stevens. (The site has since posted a retraction and Thomas and Stevens admitted it was an April Fools' gag.) Thomas has often sung of her love for her friends in the past, and she seems to have many good ones -- and talented ones, too. She's probably someone who sends a lot of birthday cards. So it shouldn't be much of a surprise that Thomas has titled her latest release These Friends of Mine and recorded it with the significant contributions of a pair of pals. Tracks were laid down over the course of two years in a small Brooklyn apartment she shared with Stevens and Witmer. Setting up in the living room whenever they felt like it allowed the trio to take a relaxed approach to the recording, and that carries across. The songs sound much like everything else in the Rosie Thomas catalog, which is to say they are largely folkie ballads with an almost-precious cast -- she does dot the "i" in her name with a heart, after all. But they're saved by the fact that they're both heartbreakingly beautiful and they seem painfully authentic. And not in a sophomoric-diary-entry way but in an artful, these-are-my-true-feelings way. These Friends of Mine doesn't feel quite as hurried as her last two records, especially 2003's Only with Laughter Can You Win. “Whether you are a musician, painter, or whatever, there is a passion that sometimes gets lost because all of the sudden you have to clock-in or have deadlines", she says in her press literature. "I sort of wanted to get back to that time when I played music for nothing". She seems to have found the right vibe: there's a lot of joking between tracks, and the songs have a very pleasant, comfortable air that works well with Thomas' childlike voice and the spare instrumentation. Stevens' banjo shows up on "Why Waste More Time" to great effect and there are a lot of songs built around simple, finger-picked guitar. Thomas is in fine form, and songs like "Kite" and "Much Farther to Go" and "If This City Never Sleeps" are as good as anything she's done. The themes of the record are practically Thomas trademarks by now: family, love, longing, and, you guessed it, friendship. But the city of New York, which Thomas calls an "obsession" of hers, plays a large role, too. Especially in "Much Farther to Go", "If This City Never Sleeps", and the obvious "New York City". Each of these, in one way or another, explores the obvious appeal the city has for her, but also the toll that living there takes on relationships with loved ones far away. As a courtesy to buddies Witmer and Stevens, Thomas does three cover tunes. Two have been played by Witmer -- Fleetwood Mac's "Songbird" and Witmer's own "Paper Doll" -- and one by Stevens -- R.E.M. 's "The One I Love". Hearing Thomas doing Stipe's classic kiss-off removes the irony from the song and makes it far less effective. Both "Paper Doll" and "Songbird", on the other hand, are stunners, the latter a natural for Thomas due to its themes. Taking a step away from the pressures of the studio seems to have worked for Thomas. 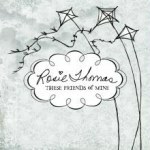 And co-habitating and co-writing with her friends proved to be a fine move as well, resulting in arguably the best Rosie Thomas record so far.